Last week was my first time to attend a funeral here in Korea. My first sister-in-law’s (keun hyongnim) father passed away after losing the battle to lung cancer, he was 72. It was on Wednesday night that we went to the hospital’s funeral buildingto give our last respects. As a “relative”, we had to wear decent clothes. I wore an all-black ensemble while my husband put on his gray suit. The funeral building were located at the back of the Cancer Center. The building’s exterior is simple, devoid of decorations except for the funeral wreaths. Inside were five rooms that were all occupied. My keun hyongnim’s father’s remain was in the first room. On the left side from the door was a table with an account book on top. Mats were laid on the floor. The coffin, in plain brown-painted wood, was covered with lots of white flowers. A simple portrait rests on the middle of the coffin while a small table was placed in front of it to hold the incense and a donation box. Upon entering, we were received by my keun hyongnim’s two younger brothers and her husband (first brother-in-law or keun abujonim). They were all wearing black and brown armbands. We burned incense and placed them in a bowl. We bowed twice to the coffin as a sign of final respect and put the envelope containing money in the donation box. After that, we bowed to the males and they bowed back. Then we left the room to look for their mother who was being consoled by some relatives. Across the funeral building is another building that was also divided into five rooms. That is where the guests were offered food and drinks. 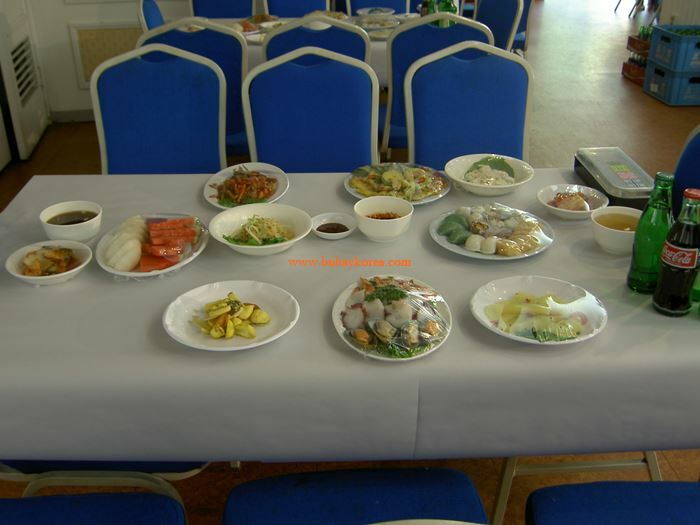 We were served several kinds of rice cakes, kimchi, pork, salads and drinks. Outside the building were some men who were drinking soju and playing cards. That was the first night of the funeral. We didn’t go to the second day of the funeral. On the third day, the body was cleaned and buried in the mountains, were Koreans traditionally bury their dead. One thing I’ve noticed during the funeral was that most people came in wearing suits or dresses. Just a few teenagers went there wearing casual clothes while the women of the grieving family wore simple white hanbok. Yesterday (Sunday), we attended my husband’s best friend’s wedding in their hometown of Jecheon in Chungcheongbuk-do. The city is a two-hour drive from Seoul. It is famous for apples, the Uirimji dam, settings for a couple of Korean dramas, a man-made lake and the first Korean who reached the top of Mt. Everest. 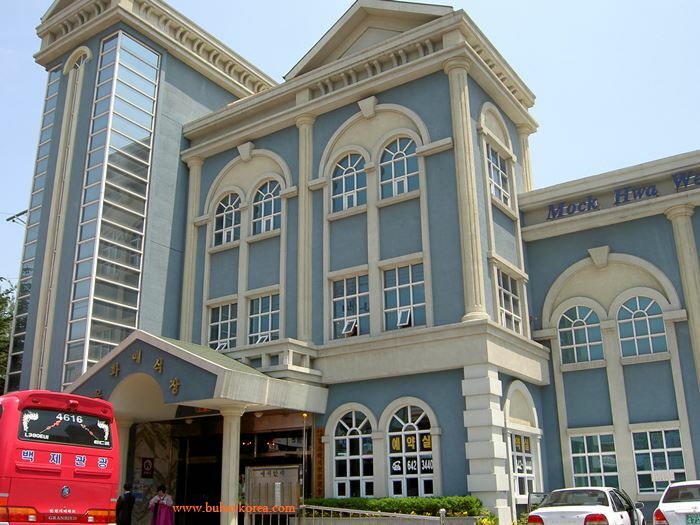 Korean weddings are usually held in wedding halls for the middleclass and hotels for those who can afford it. I was told that a typical wedding would cost anywhere from 20,000,000 KRW to 30,000,000 KRW ($20,000-$30,000). Quite expensive considering how simple and short the ceremonies are. The wedding was held in a wedding hall. They took care of everything including the food, the couple’s clothes, make-up, flowers, bride’s assistant, photography, videography, and invitations. Unlike Filipino weddings, there were not bridesmaids, ushers, best man, matron-of-honor, principal sponsors, secondary sponsors and kids :D. The entourage was composed of only the couple, their parents, the celebrant (usually a professor) and an emcee (in this case, my husband). The bride has an assistant, who looked after her (and the gown). 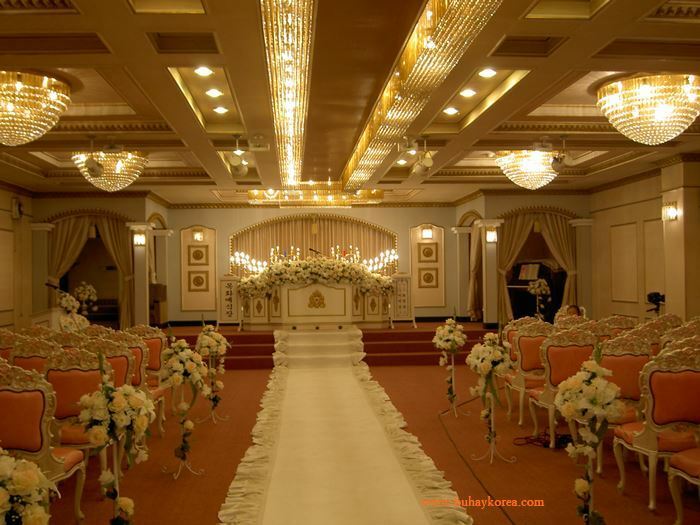 The building has three floors with a wedding hall on each floor. The wedding was held on the second floor. Outside the hall was a table where two men sat with account books in front of them. They receive the gifts from the guests and record them on the books. Wedding gifts in Korea means money. There’s no need to spend hours thinking about the perfect present. In our case, we gave them 50,000 KRW ($50) which is appropriate considering our stature. When I glanced at the books, I thought a lot of the guests gave the same amount :D.
The ceremony started at 1:30 PM. And it lasted for 15 minutes. It began with the couple’s mothers going to the altar and bowing to the celebrant. They then lighted the candles and bowed to each other. Then the groom walked to the altar and waited for his bride and her father to march. After bowing to each other, the couple had to walked toward the altar. Then the celebrant made his speech and declared them married. They had to step down from the altar and bow to their parents and the audience. That simple! The picture-taking took a lot more time because of the photographer’s “meticulousness”. The throwing of bouquet is so different from the way we do it. Korean style meant having a girl who’s going to get married next posed to receive the bouquet. There was no fighting over the flowers! After the wedding, the couple proceeded to another room where they had their Korean ceremony. We didn’t go there anymore since only the family members had to be there. We just proceeded downstairs to the reception. Some of the guests already ate before the wedding even started, that’s normal. There were no presidential tables nor after-wedding party. We just chose our table and were served. The food was not really that special since they were the kind of foods that Koreans eat everyday. All in all, the wedding was so simple and I liked it compared to other Korean weddings I had attended. This one was quiet and without frills. Other weddings I’ve been to had fog machines, bubble-making machines, ridiculous music (as in graduation song being played while the groom marches!) and really noisy audience. hmmm..i agree with miguk, taegu apples are really luscious! btw, betch, the wedding ceremony didnt really cost that much…the amount of money that you’ve mentioned is the “dowry” money, which the couples use to start their life together. both sets of parents will pool a certain agreed amount, and then they will buy furniture and appliances for their kids, sometimes the amount will go to “jonse” or rent money. my sis-in-law got married in a church, and they only spent 1.5 million for the reception, church fee is just a donation, the gifts to parents cost more…and then the honeymoon, and etc..etc..haaaay, buhay! Just wondering, do they practice giving dowry . Is it true it’s the bride’s parents give dowry to groom’ family. I like your blog site, Betchay. It gives me a lot of info about Korean culture. I want to visit Korea next year on Jang Dong Gun’s birthday. Can i get in touch with you when the time comes? i am ayub from pakistan, plz if u dont mind i need your email address, for a such good product!! Thank you for providing this information within your site.